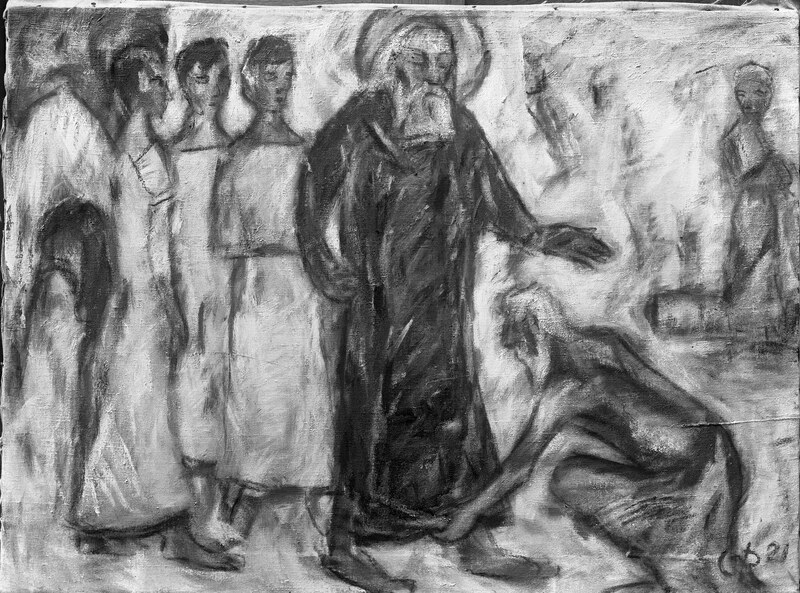 Christian Rohlfs, ‘God seeks out Abraham’, 1921. Staatsgalerie, Stuttgart. In a recent post, I suggested that both culturally and theologically, the Reformed tradition is – at its best – a broad tradition, captive to neither ethnic nor cultural boundaries, nor to either the left or the right of the theological spectrum. I also noted that the Reformed believe that the politicising of the body of Christ along lines which limit the love and availability of God are a scandal against the Table of the Lord. The Church is justified – and kept justified – by the grace of God alone and not by our efforts. All our efforts as both a claimed and proclaiming people ought to be directed towards bearing witness to this truth. Our unity in Christ, made concrete in the forgiveness of sins, means that all other distinctives are subdominant features of our being together. No one cultural or theological consortium has a monopoly on the experience or truth of God. This is not only to confess something about the fact that divine revelation is always sheer and surprising gift, but it is also to gesture towards the observation that if our knowledge and love of God (and, conversely, as Calvin noted, our knowledge and love of ourselves) is to deepen, we need to resist moves towards mono-culturalism in all its forms, whether theological, ethnic, sexual, geographic, etc. The Jerusalem Conference (recorded in Acts 15) represents, among other things, precisely such a commitment to mature in the gospel through wrestling and living together with the gospel-culture-ethical rub. The ‘other’ is not our enemy but represents God’s radical invitation to open-ended life, to dialogue, to prayer, to repentance, to growth, to transformation, to love, and to relationships characterised by mutuality, creativity, openness, trust and presence. Here one recalls the profound work of Jewish philosopher Martin Buber [and, we could add, that of Ricœur, Bonhoeffer, Sartre, and others] and particularly his essay I and Thou wherein he gestures towards the truth that it is not only one’s communion with the ‘other’ that makes human life meaningful, but also that such communion is a necessary counterpart to our communion with One who is always our ‘Other’. To give food to the hungry and drink to the thirsty, to welcome the stranger and clothe the naked, and to take care of the sick and visit the prisoner is, by the work of God, to come face to face with Jesus Christ (Matt 25; cf. Heb 13.2). To confess ‘I believe in Jesus Christ’ is, therefore, to both resist the temptation to domesticate God and to confess the absolute imperative to remain in fellowship with those with whom we disagree and with those whom we do not yet understand precisely because they too are in fellowship with God. As I wrote earlier, Jesus does not grant us the liberty to choose our friends. Rather, whenever Jesus comes to us he always brings his friends along with him as well … and he helps us to love them. It’s heartening to read the first sentence in No. 3. And the rest of the paragraph isn’t bad either.